One of the important deliverables of the African Chicken Genetic Gains (ACGG) program is to use information from surveys and on-station and on-farm testing to define the chicken breeds, phenotypes, and genotypes preferred by smallholder farmers in terms of bird colour, body conformation and temperament, egg and meat productivity and overall tropical adaptability under low-input production systems. Achieving this goal requires taking special care during data collection and data management in the farms and the ACGG team has made sure all of the program’s field staff are skilled to do just that. Fifteen ACGG field staff were trained recently on ‘on-farm monitoring’ to improve their skills in data collection and management. 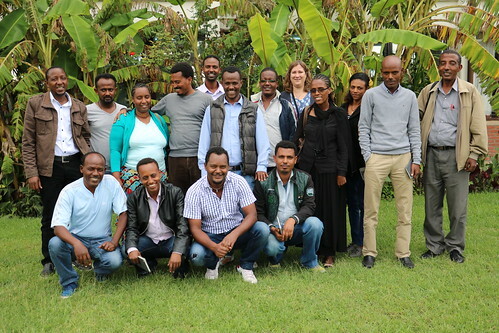 The course, which was held 23-25 March 2016 was organized by the Ethiopian Institute for Agricultural Research (EIAR) and the International Livestock Research Institute (ILRI). 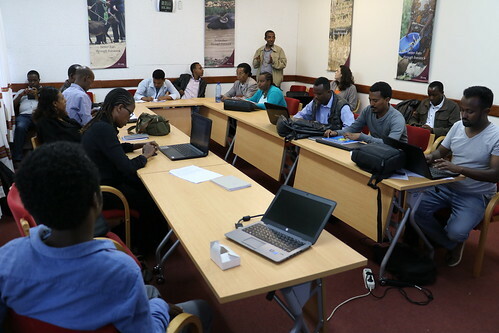 It took place at EIAR’s Holetta Agricultural Research Centre and at the ILRI campus in Addis Ababa, Ethiopia. Logistics and recruitment of households. Data collection sheets (looking at labour allocation to chickens, bird housing and water, egg production/sale/consumption, bird inventory/weight/health etc.). How to use the Open Data Kit and general data management. Setting up schedules for data collection, appointments, submission of data etc. Process for bird tagging etc. Participants also discussed and shared feedback on the ACGG on-farm study informed consent form that will be signed by participating households. They also drafted a timeline for upcoming on-farm activities. The next on-farm activities in the project will include selection and recruitment of enumerators and supervisors, translation of the consent form into national and local languages, selection of households and allocations of strains. Lists of households and enumerators in villages will be generated and updated training documents will be sent to training participants. Training of enumerators and supervisors will also be carried out. Tags: data management, EIAR, ODK, on-farm. Bookmark the permalink.